Boating is quite popular in Cedar Key, whether you're fishing, sightseeing, bird-watching, kayaking, or just "paddling about". Due to the fairly shallow waters of the Gulf around Cedar Key, paying attention to tides is critical - don't get stranded by low tide! There are several options for boating in Cedar Key - whether you bring your own boat, rent a boat or take a tour. You're sure to love boating in Cedar Key! Cedar Key Boat tour operators will take you out for a cruise around the islands, drop you off on one of the keys for a picnic, or will rent you a boat to enjoy your own Cedar Key adventures! 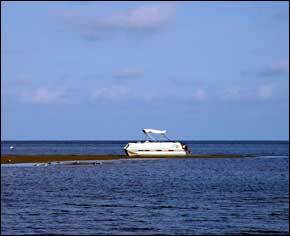 Check out Tidewater Tours for excellent tours of the estuary and Cedar Keys. Several Cedar Key and southern Florida Big Bend destinations. The Marina is located on Route 24 in the blue building on the north(ish) side of the road. Boat rentals, repairs, supplies, and what have you - check their website for details. Wind, temperature, and historical data. Check the Tides in Cedar Key! Boating basics, links to courses. The rules of the sea (in Florida). Now you can rent a boat from Tidewater Tours! Great prices and great boats! Cedar Key Boat Rentals and Island Tours! Cedar Key Boat Rentals and Island Tours is the island's newest boat rental company. Located right on Dock Street, at the marina, you can take your pice of pontoons, Carolina Skiffs or polars! Very convenient! Located on Rt. 24, the Cedar Key Marina II offers boat rentals, mechanics, gas, and boat storage. See the Cedar Key fishing page and the kayaking Cedar Keys page for more links! Are you ready to make Cedar Key lodging reservations for Tranquility?